In 2007, U.S. Army Specialist Jorge G. Sandoval Jr. was charged with murder by the very government he had sworn to serve. While deployed to the most dangerous area in Iraq known as the “Triangle of Death,” Sandoval, an airborne infantryman and elite sniper, was instructed to “take the shot” and kill an enemy insurgent wearing civilian clothes. Two weeks later, Army Criminal Investigation Command descended upon Sandoval’s unit and began interrogating the soldiers, trying to link Sandoval and others to war crimes, including murder. 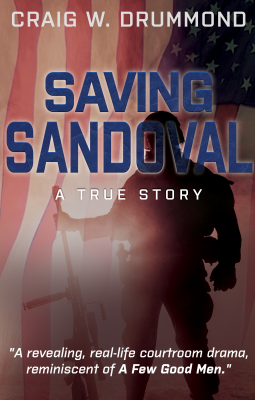 SAVING SANDOVAL covers the events from the moment the trigger is pulled through the trial in a U.S. military compound on the outskirts of Baghdad during the height of U.S. military surge of troops into Iraq. The book brings the reader into the reality of modern warfare in a post September 11th environment where the enemy does not always wear a uniform and if an event makes headlines military leaders are quick to point the blame on the lowest ranking soldiers regardless of the injustice. The fast-paced and detailed account of the investigation and trial testimony from elite Army snipers brings the reader into the courtroom and onto the battlefield of Iraq. Price discounts and standard return policies are available for bookstores through Ingram. Others wishing to order quantities of 20 or more may contact us directly at info@wildbluepress.com for discount pricing.